I'm a huge fan of micellaire waters. They're not harsh on the skin, and are so easy to use. I was cleaning out my cupboard the other day, and realized that I had 4 different types of them (can you say addict?) So for this weekends post, I thought that I would break down the pro's and con's of each one. 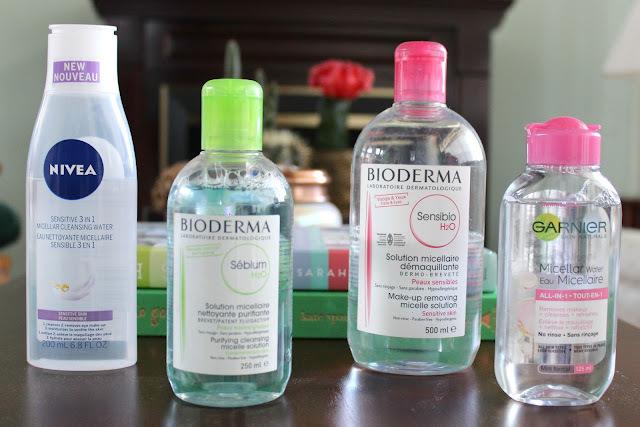 This was the first micellar water I tried. I had heard a lot of the British bloggers rave about it as an alternative to Bioderma (since it's less than half the price). I think it's a really good product. I think the Nivea one requires a bit more effort than the others to get your makeup off, and I find that my skin doesn't feel quite as soft and clean after. It's still a great product, don't get me wrong. But because all four are so similar, I'm getting nit-picky here. If your not willing to pay a lot, then this is still a fantastic option. Plus, the smaller size means it's great for travel. I have super oily skin, so I was all excited to give this one a go. And to be completely honest, I don't think it works much differently than the original. While my skin still looks healthy and almost glowy, it feels more matte to the touch. Aside from that, I find the properties to be very similar. I will add that it feels a tiny bit harder to get mascara off than the original. But again, nothing groundbreaking. The original, tried and true favourite. I don't think there is a beauty blogger who hasn't given this product a go. It's the original micelle water, derived from France. I love this product, and it's one that I can get behind all of the hype. It works amazingly at removing makeup. It doesn't strip the skin of natural oils, but does provide a remarkably clean surface. It has no scent, so it's great even for the most sensitive skin. Of all the products, this one is by far my favourite. It's the quickest at removing my eye makeup, even stubborn mascara. It's the most expensive of the lot (coming in around the $26 mark), but it's also the largest of the group, and lasts a good few months. Plus, Bioderma almost always have promotions on at the drug store. I got this as a sample size product with a dark-spot corrector I purchased the other day. Everyone and their grandma have been raving about this as the new best drugstore micellar water. But I'm going to say it: I'm not that impressed. I found this was the worst at getting my mascara off, and I needed to really scrub at my eye. I also found that it left a tacky residue on my skin, which seemed to last for hours. Overall, I'm going to have to declare the original Bioderma the clear winner. It's a cult classic for a reason. It's an effortless option which makes an otherwise mundane tasks more enjoyable.